Next review Empire Today - Great Experience! Our customers are our number one priority, and we strive to provide a positive experience from start to finish. We’re committed to upholding our reputation and achieve our vision to become America’s first and best choice for installed flooring. We appreciate you making us aware of this matter, and regret to hear that you feel this way. We’ll be following up with you soon to discuss your concerns and continue working towards a solution. The purpose of this correspondence is to express my disgust and disappointment with Empire. For a company that has extensive advertisements on television and stands firm by their mission to please customers, they have really shown me what customer service should never be. My first disastrous experience with Empire was on 7/8/2015 order #W216564 (Owings Mills, MD). 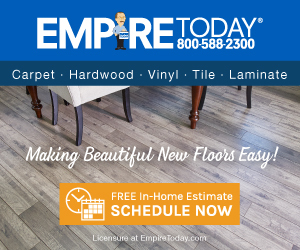 After shopping around and getting quotes from different companies to install carpet in my house I just purchased, I made a conscious decision to go with Empire because of the representation of the company over the phone, and in person when the representative came out to give me an estimate. The initial meeting went great and I was given a date for installation. The installers, contractors that Empire uses and goes with the lowest bidder, came out and had to take cable wiring off of various parts of my wall throughout my house. After the carpet was installed, the gentleman informed me he was finished and asked me to sign some documents. Prior to signing the documents, I informed him I wanted to see the work that was done. As I checked out each of the rooms, I noticed that the wiring, that was removed by Empire, was still hanging. I asked the gentleman if he was going to finish the work by placing the wires back where he found them, and he informed me that he would not. I could not understand his resistance, for he was the one that removed these wires. I asked him again to please put all the wiring back as he found it and he again said he wasnt doing it. At this point I became upset and told him to get out of my house. I called Empire and informed them of this unprofessional behavior by a contractor they hired and told them that my install was not complete. Of course, they apologized for this experience and tried to send the installer back continuing to apologize. After that experience, I vowed I would not utilize Empire again. Although I had a tumultuous experience the first time, I decided to give Empire another chance. I again shopped around for quotes on replacing my kitchen floors and because of the promises from the salesperson, I put my faith in Empire, unfortunately, again (order #1-2752310805). The salesperson took measurements and gave me a price and date for installation after receiving my 10% down payment. The day of the installation, I took off from work (losing money for the day), disconnected my gas stove, and disconnected my refrigerator placing the food items in a couple of coolers prior to the installers arrival. The installers arrived and were professional upon greeting me. Within a few minutes of their arrival, I noticed them looking at the floor and discussing something in Spanish. Shortly after I was informed that they were not going to be able to perform the installation because of an issue they observed, within minutes, with my sub-floor. Of course, this issue was going to cost me a significant amount of extra money. The installers stated that this was something the salesperson should have noticed and factored in with the estimate. I lost money for the day, had to reconnect my refrigerator, and lost various food items all for nothing. As a consumer I just thought you should know that I have never experienced such an unprofessional inconsistent company in my life. Your attention to detail is horrible and all your company seems to care about is completing a sale. The sales personnel only cares about getting that commitment and could care less about the ending result. I was the fool for giving your company a second chance and I will inform everybody within my sub-division about my experience. This is a terrible representation of your company and your company as a whole should be ashamed. Review #1085729 is a subjective opinion of Sluggz.